With the markets overflowing with summer squash lately – zucchinis, crooknecks, straightnecks and pattypans – I thought that it was time I explored a recipe that highlighted their unique qualities: tender flesh, smooth edible skin and mild creaminess that compliments any summer meal. Which ever one you choose, summer squashes are excellent sources of manganese and vitamin C and a very good source of magnesium, vitamin A (notably through its concentration of carotenoids, including beta-carotene), fiber, potassium, folate, copper, riboflavin, and phosphorus. Many of these nutrients have been shown in studies to be helpful for the prevention of atherosclerosis and diabetic heart disease. 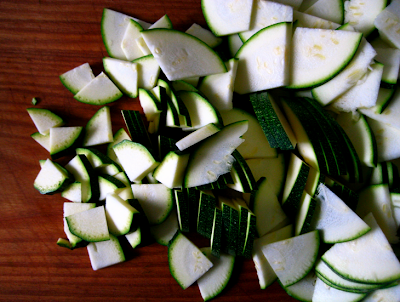 Summer squash’s magnesium has been shown to be helpful for reducing the risk of heart attack and stroke. Together with the potassium in summer squash, magnesium is also helpful for reducing high blood pressure. The vitamin C and beta-carotene found in summer squash can help to prevent the oxidation of cholesterol. Since oxidized cholesterol is the type that builds up in blood vessel walls, these nutrients may help to reduce the progression of atherosclerosis. I had never baked a tart before, but this was surprisingly easy with an impressive product to bring to the table. The tart crust boasts a fantastic flavour with help from the sage and lemon zest, but you can also use thyme, rosemary – any woody herb would do, really. The sauce recipe is a slight variation on the pizza / pasta sauce I always use, posted first here. And the vegetable mixture is completely versatile, so use your favorites. I prefer to use seasonal produce in order to receive the most flavour and nutrients. In late summer or early autumn I will try sweet potatoes or butternut squash with mushrooms and cauliflower and kale….mmmm! I’m excited! I love versatile recipes. 1. Preheat your oven to 375F degrees, and place a rack in the middle. Oil a 10-inch tart pan and set aside. 2. 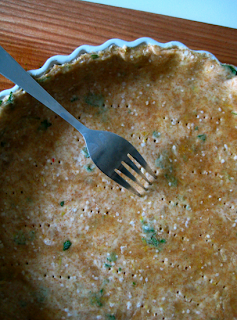 To make the tart shell combine the flour, herbs, salt, and lemon zest in a large mixing bowl. Drizzle the olive oil over the flour and stir that in as well. Drizzle the cold water over the flour and mix with a fork just until it is absorbed. Knead one or twice – just until the dough comes together into a ball. On a lightly floured surface use a rolling pin to roll the dough into a circle roughly 13-inches across. Ease the pastry into your tart pan (I cleverly placed the tart pan upside down on top of the dough and flipped the cutting board I was rolling it on!) and press it into the corners and up the sides without stretching the dough. Trim away any excess dough, and place the pan in the refrigerator for at least thirty minutes. When the dough is done resting, prick the crust with a fork a few times. Now line the pastry with parchment paper and fill the tart with pie weights (alternatively you can use beans or lentils). Bake for 15 minutes. Carefully remove the paper and pie weights, and then toast the tart crust in the oven for another five minutes or so before transferring it to a rack to cool. Leave the oven on, but dial it down to 350F. 3. Sautee and season the spring vegetables on low heat until they soften slightly and taste delicious. Set aside. 4. Make the sauce by stirring the garlic, olive oil, red pepper flakes, and salt together in a small, cold saucepan. Turn the heat to medium-high and cook until the garlic starts to sizzle just a bit. Stir in the crushed tomatoes, bring to a simmer, cook the sauce down a bit, 10 minutes or so, then remove from heat. but not quite fill the pan. 6. Place the tart on a rimmed baking sheet – in case you end up with an overflow – and bake for roughly 40 minutes or until the tart is cooked through. Remove and let cool for 10 minutes before serving. 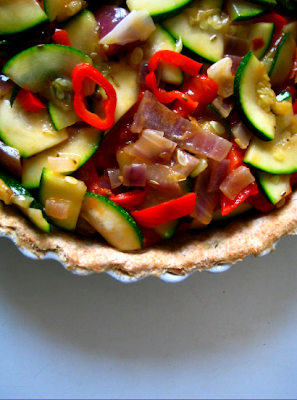 Tips: For you dairy lovers out there, I bet that this tart would be delicious with some cheese; parmesan dusted on top, or ricotta in a layer somewhere between the vegetables and sauce. Make sure you buy organic! i always thought zucchini and squash were they same thing..
anywhoo, sarah email me! i don’t have yours.